Some people don't want to spend the time and money maintaining different programs, but instead use an all-in-one computer protection suite so they can enjoy the Internet at home or focus on jobs at work. An Internet security suite is what they want to help protect a network from malware, intruders and other types of attacks. Agnitum, the maker of the popular personal firewall software, is also offering an Internet security suite for Windows PC. The program provides anti-malware, anti-spam, firewall and more. 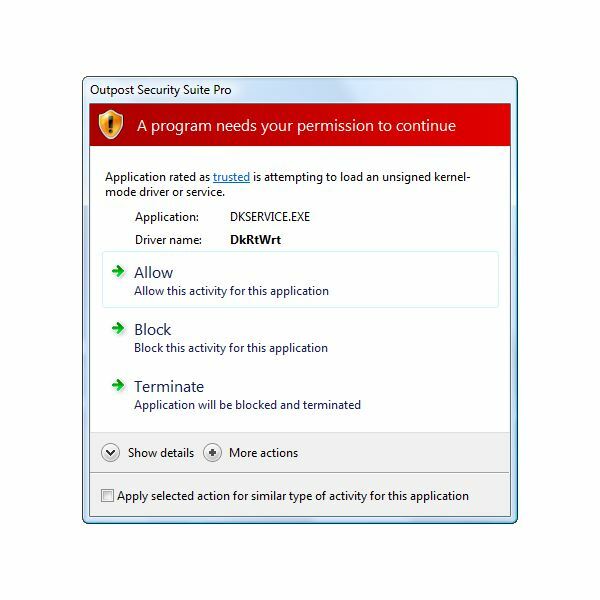 Read on to find out what protections you'll get using Outpost Security Suite Pro. You'll also find in this review how the program will actually perform when you visit dangerous links and if Outpost antivirus will really help to protect a computer against malware. This Internet security software by Agnitum runs on 32-bit and 64-bit editions of Windows 7, Vista, Windows XP with Service Pack 2 or higher, Windows Server 2003 with Service Pack 1 or higher and Windows Server 2008. The anti-spam feature in the program supports The Bat!, Windows Mail, Outlook Express and all versions of Microsoft Outlook. 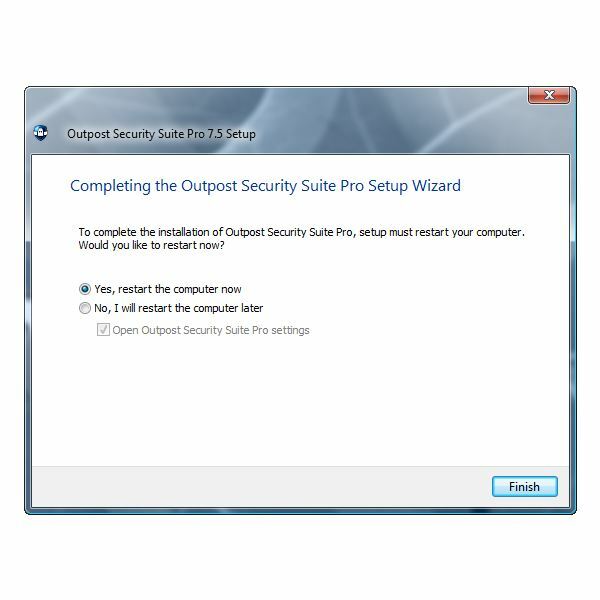 Installing Outpost Security Suite Pro v7.5 in Windows is quite easy because it provides two installation options – an expert and a simple mode. True experts will definitely take advantage of the expert mode option since it allows them to choose which components of the Internet security software to install and what type of firewall policy to use. The simple mode is the best option for inexperienced users because the installer will automatically detect which components should be installed on the computer. Also, it will use a learning mode feature, in addition to automatically creating and updating firewall rules so there are less alerts on trusted and digitally signed applications. A system restore point will be created during the install process so you can easily restore the computer to its previous state if the installation becomes corrupted or if the computer won't run normally after installing Outpost. 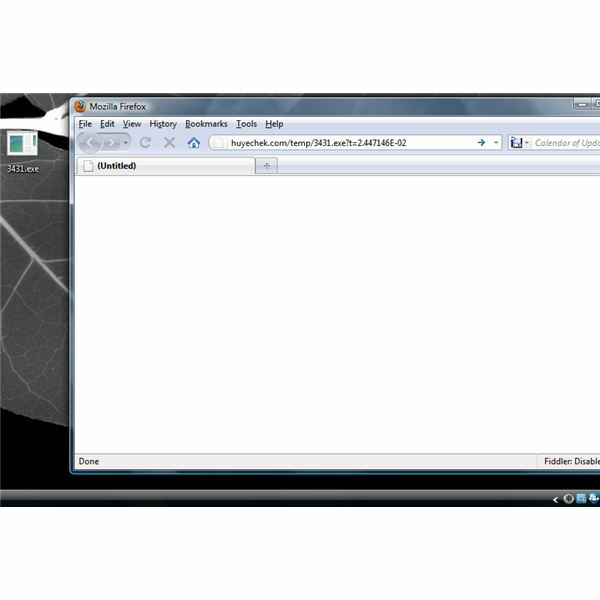 Quick Tune – an add-on for Internet Explorer allowing Internet users to drag and drop unwanted ads in any websites and easily access the options of Web Control feature of Outpost program. Outpost Hooking Module – a dynamic link library (filename is wl_hook.dll) that will protect the computer even before the firewall program starts. This module will automatically starts during Windows startup. 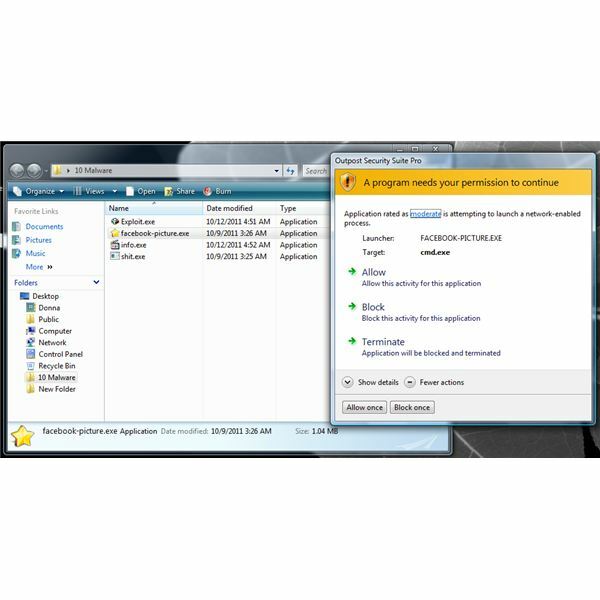 OutpostMonitor – a startup item for Windows using the filename op_mon.exe. 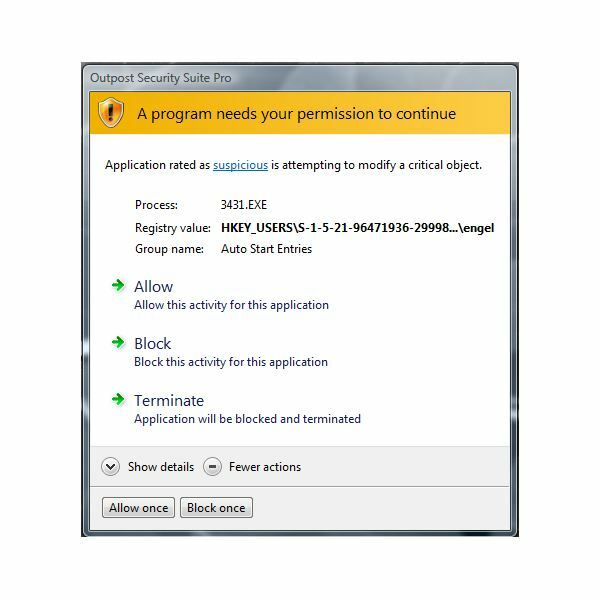 Outpost Shell Extension – a context menu scanner of Outpost antivirus program. Agnitum Firewall Core Driver, Outpost Service, VirusBuster Loader SYS and Host Protection Component – these are the required services and drivers for the program. Microsoft Visual C++ 2008 Redistributable. Note that when you used System Restore in Windows to restore the computer to a previous state, this program will not be removed. You need to manually remove this software in Add or Remove Programs in Windows if you don't plan to re-install Outpost software. A computer restart is required to finish the installation of Outpost software. However, you don't have to restart the computer if you want to configure the program first. There is an option to not to restart and to open the program settings so you can change the way the program will run before you will proceed to restart the system. You can opt to use any of the two available user interfaces (UI) of Outpost – a simple or expert mode. The latter mode provides access to online and network activities, used ports, process, files and registry activities of the computer. 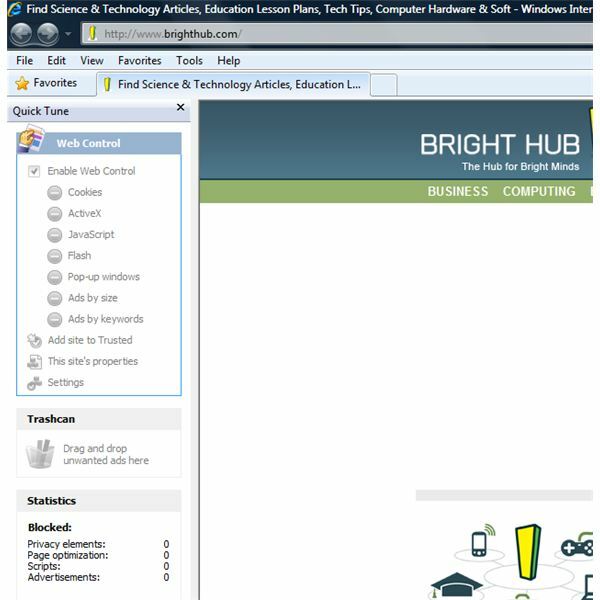 All other tasks in using the program are available to both modes. 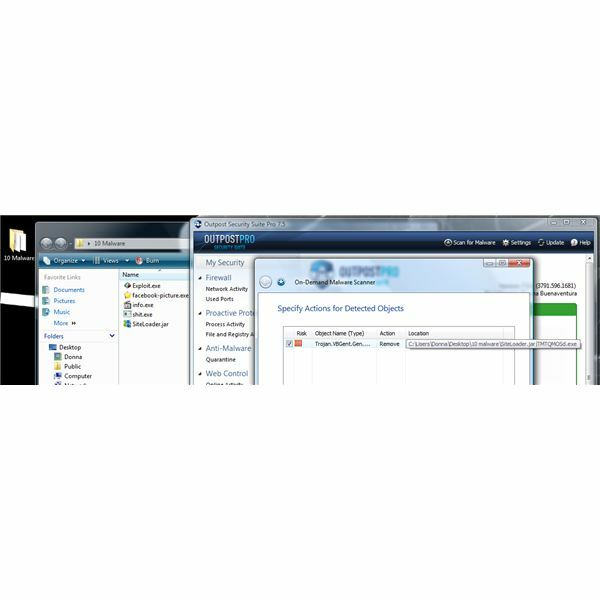 The program's tray icon includes handy commands for using Outpost, such as opening the UI and changing the settings of Outpost, suspending protection, entering the learning mode, disabling self-protection, changing the firewall policy and running a malware scan. When you clicked "scan for malware" from the tray icon, it is not only the malware scanner window that will open, but also it opens the program's main UI. You cannot close the main UI of Outpost when the on-demand malware scanner window is opened, unless you choose to run a background scan while the scanner is already scanning the computer. The main UI won't close even if you paused the scanner and minimized the scanner window. When you select the "background" button to run the scan in the background or minimized, the program's UI continues to display on the desktop screen. The UI should not appear together with the malware scanner window and if it's required for some reasons, it should close as well when the user selected to run the scan in the background. SmartDecision – a new technology in Agnitum products that scans each executed application in the computer. It uses a risk-evaluation system that defines the status of a file as to whether it's good or potentially dangerous. The user is notified by a visual recommendation with matching color – green, yellow or red – and can choose how to proceed. Note only that not all red dialog alerts means the executed application is bad or dangerous. An example is the image below where a trusted application tries to load an unsigned kernel driver. 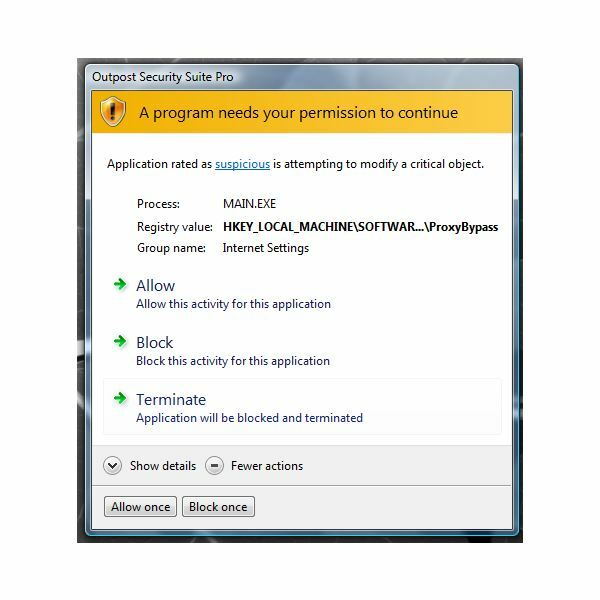 If you know the application is safe to do what it has to do on the computer, simply choose 'allow'. Clipboard content protection – Agnitum noticed a new type of malicious software which grabs personal information from the clipboard or sends randomly taken screenshots to hackers. The clipboard content protection is now included in Anti-Leak protection module of Outpost so you don't have to worry about cutting, copying or pasting personal information online. PDF Filtering – the Internet security suite and the standalone antivirus program by Agnitum now includes an enhanced PDF scanning module which checks damaged and non-standard PDF files. Note that this feature is not included in the standalone Outpost Firewall Pro or free editions. USB virus protection – Outpost will now protect the computer against autorun viruses. Advanced users have the options to disable autorun.inf file without blocking the program, completely block the USB device, block all executables and scripts on the USB device or just block scripts and executables if the publisher's digital signature is not found. Fewer actions switch – Version 7.5 of all Agnitum products let you decide now without going through many clicks for additional actions on any alerts presented by the program. Agnitum has added security improvements for the 64-edition of Windows OS. They've also added firewall compatibility for 3G modems or mobile broadband devices and have integrated eXtended Heuristic Analyzer (HAX) in the SmartDecision technology. The antimalware engine and SmartScan technology has been updated to v5.3 and v4, respectively to enhance performance during scanning and real-time protection. Last but not the least, the vendor has reworked the firewall and web control components for optimal performance. What you will get in addition to the above features and improvements? Outpost Security Suite Pro v7.5 contact, infection and data leak prevention, in addition to resident protections. All of these are offered along with antivirus, firewall, anti-spam, web control, system guard, anti-leak, file and folder lock, IP blocklist and more. You also have the option to send suspicious files to Agnitum servers for further analysis, to use the exclusion manager, manually update the program or simply depend on automatic updates which you can configure hourly, daily or weekly and log all the activities of the program. Note that Outpost anti-virus is a redesigned and enhanced implementation of technology licensed from VirusBuster, a Hungarian anti-virus developer. The only feature that I am hoping Agnitum will add in its program is the ability to effectively block phishing websites. I have not seen the developer of Outpost add an anti-phishing feature in their program. The web control feature in Outpost is only focused in blocking websites with malware threats. The program is not causing any performance issue at all, whether you're running a scan or using the computer and other applications. I opened a few cleaned PDF files and I noticed a short pause in loading the PDF document which I believe, Outpost PDF filtering, a new feature in the program is doing its job to check if the PDF file is infected or a malware file. The memory usage of Outpost is around 4 MB only. However, the memory usage will increase during a system scan up to 27 MB. During the review, I checked how long a scan will finish using the default setting in Outpost: a quick scanning of 68,207 files finished in 10 minutes, where a full system scan finished in 2 hours for over a million files (1,136,065 files to be exact). This performance is not bad at all especially if it is scanning thoroughly. You'll notice that some malware scanner's quick scan will finish in less than 2 minutes, but it only scanned 4,000 files. DivX Plus program or its files aren't malware at all or not infected so I asked the program to ignore the detections. If you come across such false detections, do not choose to ignore the risk, but only choose to ignore the files. The scanner will add ignored detections in the exclusion list. It also detected infection in the Windows Hosts file, simply because the Hosts file in this test computer is using custom list that I setup myself. I executed the remaining 4 malware files to find out if the antivirus program or any protection modules of Outpost will trigger any alert. All files were not allowed by Outpost to immediately run because its SmartDecision technology, System Guard and Anti-Leak modules are monitoring the computer in real-time. 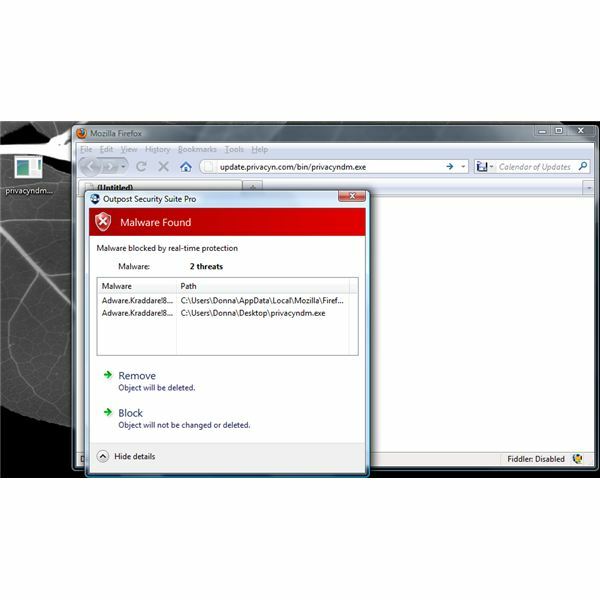 Note that the first screenshot below is an adware that is not detected at all by any antivirus scanner in Virustotal.com, but Malwarebytes is able to detect it. I also proceeded to check the proactive detection capabilities of Outpost. 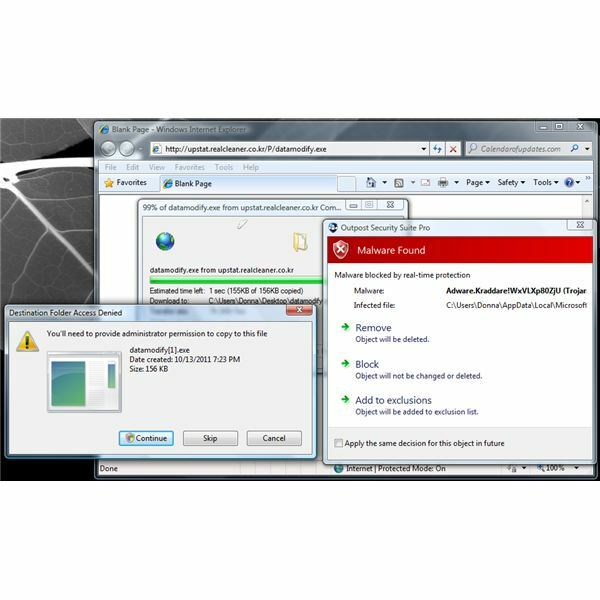 The program failed to block a drive-by exploit in two different websites but was able to block the download of two fake antivirus programs, both from different sources. 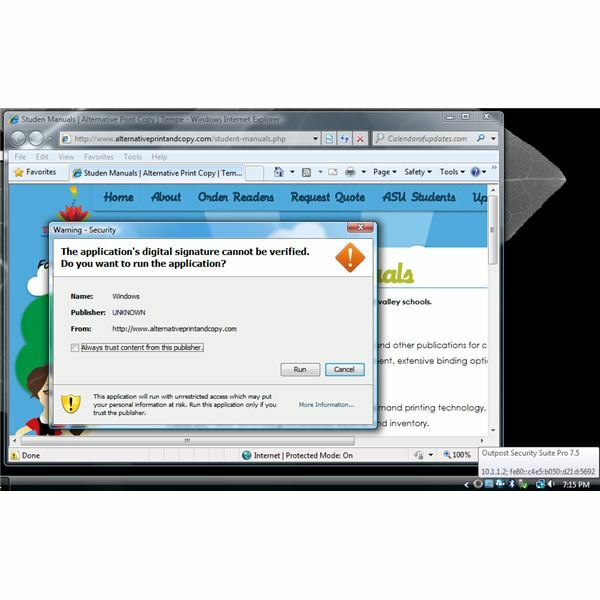 Outpost also failed to block or prevent the download of two malware – a TDSS and a backdoor Trojan. Check out the screenshots below for this particular test. at detecting the malicious files. I decided to execute the two malicious files to find out if any protection modules in Outpost will trigger an alert. Outpost proactive modules have helped in preventing the infection (see below screenshots) because the risk-evaluation system of SmartDecision technology is working as claimed. You're going to fork out $40 to enjoy the malware and intrusion protection in Outpost Security Suite Pro for a single computer or $50 for up to 3 computers. It's an inexpensive Internet security suite if compared to the widely-used Kaspersky and Norton which are sold for $60 for 1 PC and $70 for coverage on up to 3 PCs, respectively. 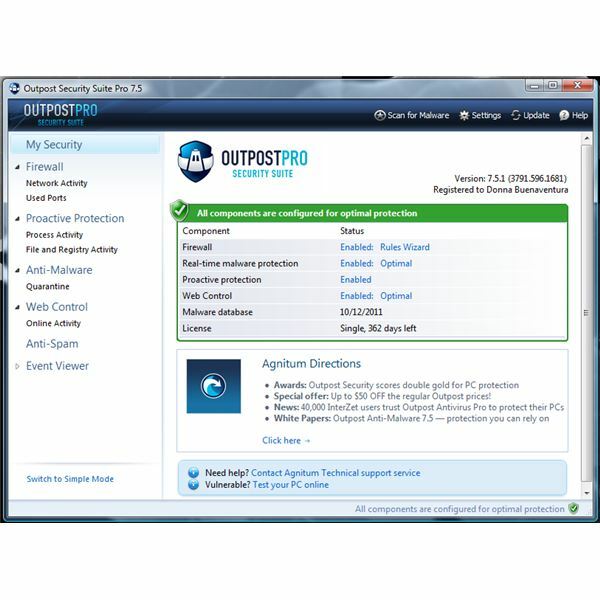 Outpost Security Suite Pro v7.5 is a highly recommended program because it offers more than other Internet security suites. Its proactive protection modules and several types of detection technologies are quite advanced and truly effective. If any malicious file is able to bypass the antivirus program, expect the rest of the Outpost protection modules to prevent any malicious activities, whether your PC is online or offline.